INSPIRESats 1,2,3, and 4 carry a variety of payloads for ionospheric measurements (1 & 2), an ultraviolet imager (3) and an infrared imager (4) conducting Earth and solar observations. The spacecraft for all of these instruments is the INSPIRE spacecraft bus. All four missions use the same architecture for an onboard computer, power modules, flight software, etc., which have all been developed as part of the INSPIRE program. 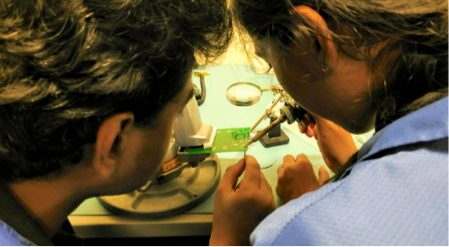 The INSPIRE spacecraft bus is a custom-­sized microsatellite that is deployed via a ring deployer from the ISRO PSLV launch vehicle, unlike other CubeSats. The INSPIRE spacecraft bus is hence a very capable small satellite platform that is developed in the open domain for fundamental space science research. The INSPIRE spacecraft bus will provide a template to enable emerging and developing nations to start space science research.